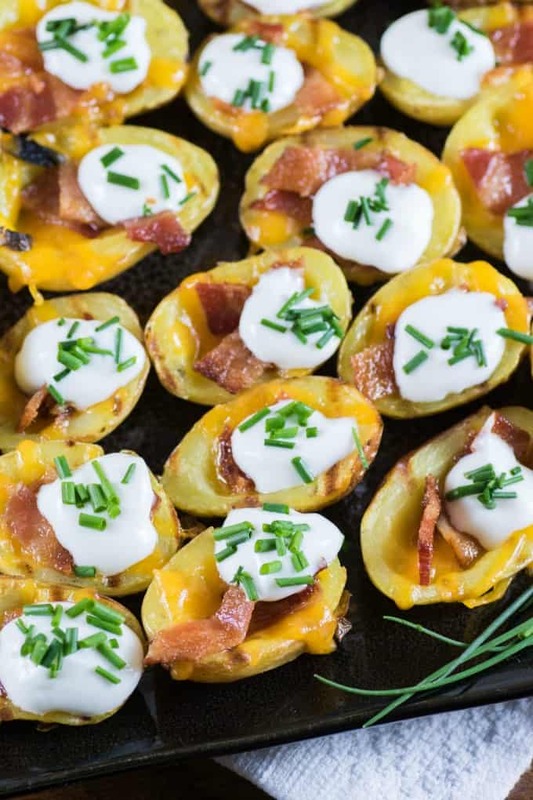 Grilled Little Potato Skins will Add a Little Sizzle to your summer! 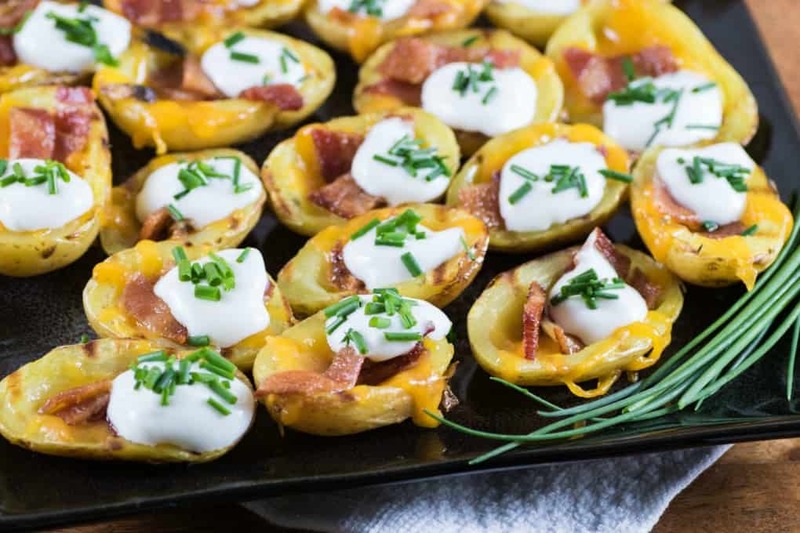 I love simple entertaining in the summer months and these Grilled Little Potato Skins are perfect!! 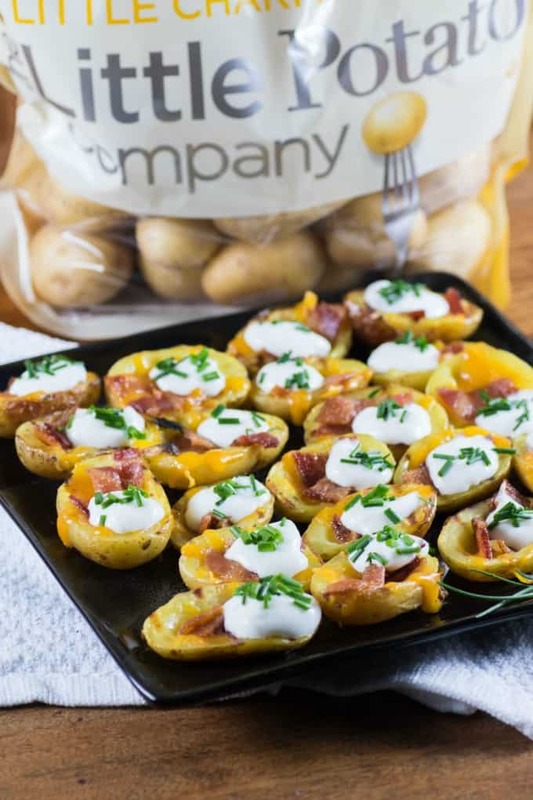 Creamer potatoes from The Little Potato Company are so easy to work with. They are pre-washed and ready-to-use-out-of-the-bag, keeping your summer meal prep hassle-free. With a little forward thinking this easy recipe can be prepped ahead of time and finished off on the hot grill. Everyone will rave over these little wonders! 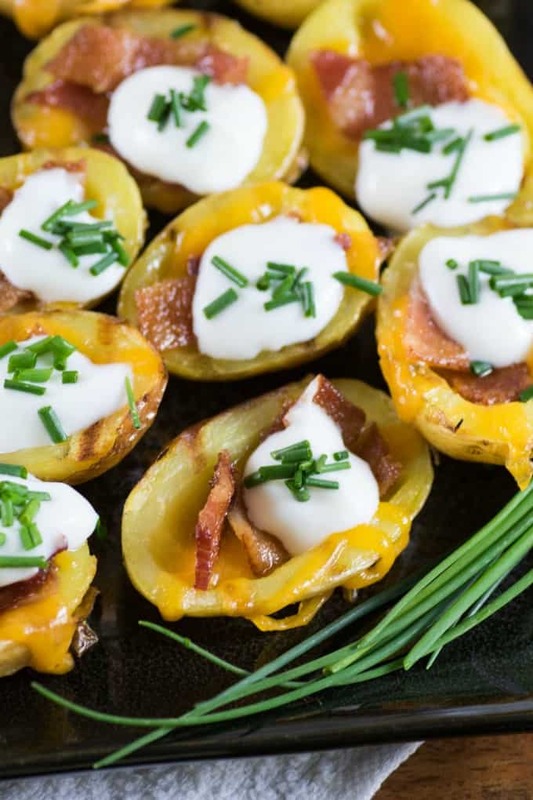 Now is the time to #AddaLittleSizzle to your summer by grilling up these little potatoes for your next patio, backyard, beach, camping or outdoor gathering!! Creamer potatoes when roasted on the BBQ stay nice and firm for hollowing out and refilling with your favorite toppings. We gobbled these down for an afternoon snack and then had them as a side for dinner. 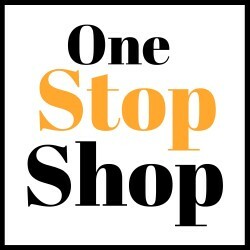 They are very versatile to serve at anytime. Imagine the rave reviews you would get at game day!! 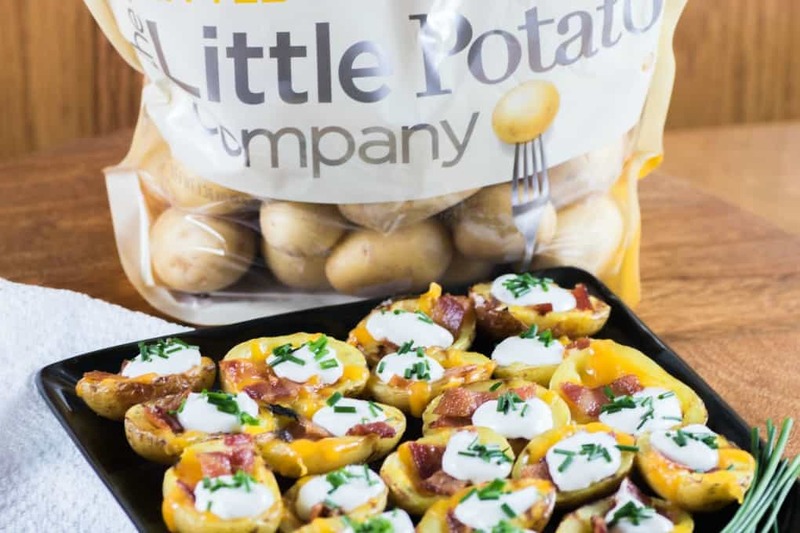 This summer, The Little Potato Company is giving away 10 BBQs to add a Little sizzle to your summer! 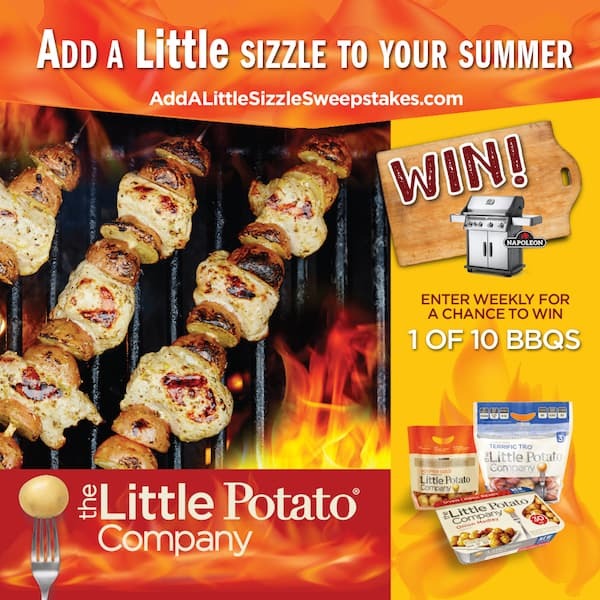 You can enter to win 1 of 10 BBQ’s in the Add a Little Sizzle Sweepstakes. It is easy to enter and do so every week until August 31, 2018. It is open to everyone across the US (except Hawaii and Alaska) and Canada (except Quebec). 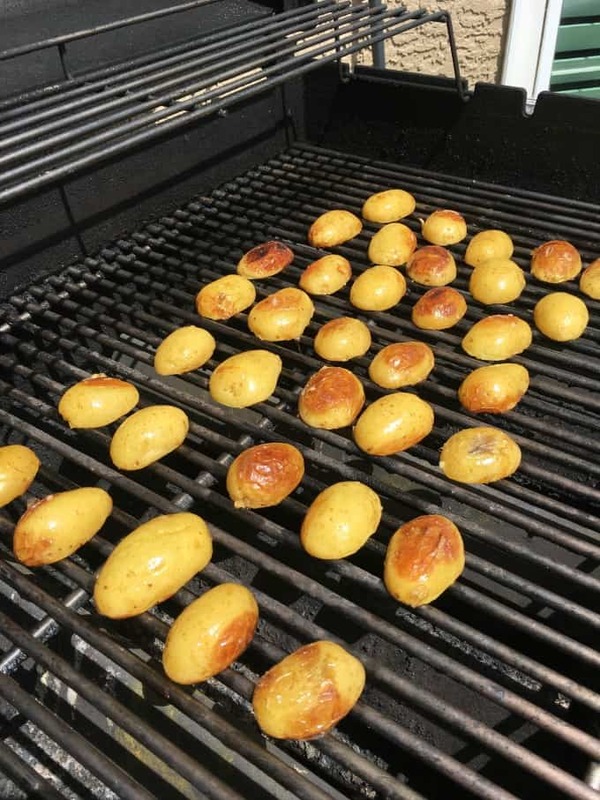 Creamer Potatoes are first roasted whole on the BBQ drizzled with extra virgin olive oil and sprinkled with Kosher salt. I made a pouch using heavy duty foil. Once they are roasted and cooled to touch, I scooped out some of the potato and then brushed them with olive oil on the inside. A quick face down grill to get some nice markings and flavor and then it is time for stuffing!! Now in for the last bake on the BBQ. At this point you can refrigerate until later. Or pop them back into the BBQ for the final melt of the cheese. I happened to have a pan with little slats but a solid bottom foil pan would work too. We loved the smoky hints that first roasting on the BBQ and then later grilling gives to the Little Potatoes. The bacon marries gorgeously with grilling. Also with the heat of summer it is so nice to not have the oven on and let the BBQ do all the work! This is easy summer fare at its finest. For this recipe we used one of The Little Potato Company’s yellow Creamers called Little Charmers, they have a natural buttery flavor so they add even more deliciousness to the recipe. 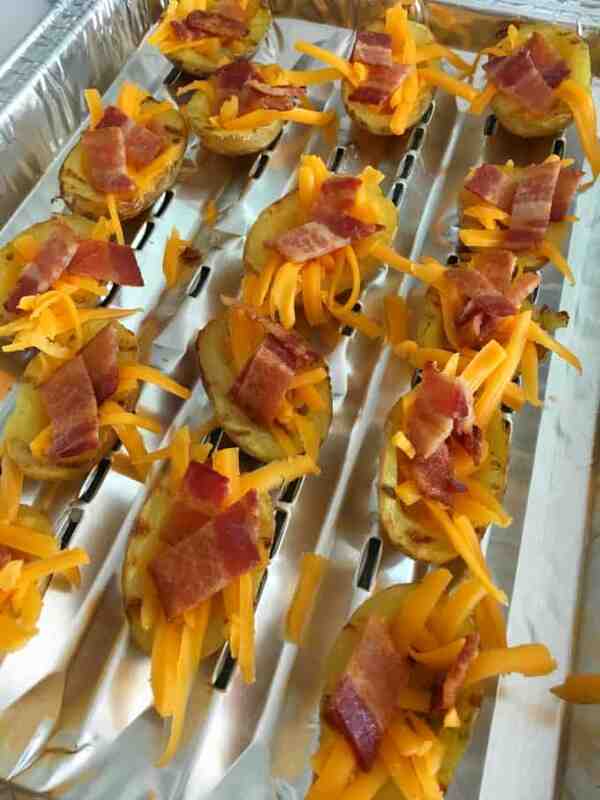 Grilled Little Potato Skins will be on our list to make all summer long and into the fall when football finals are on. Everyone young and old will be loving these!! I liked the little size of these, a simple one or two bite! We grill, BBQ and smoke all year long so these will be a hit even for Grey Cup or the Super Bowl. 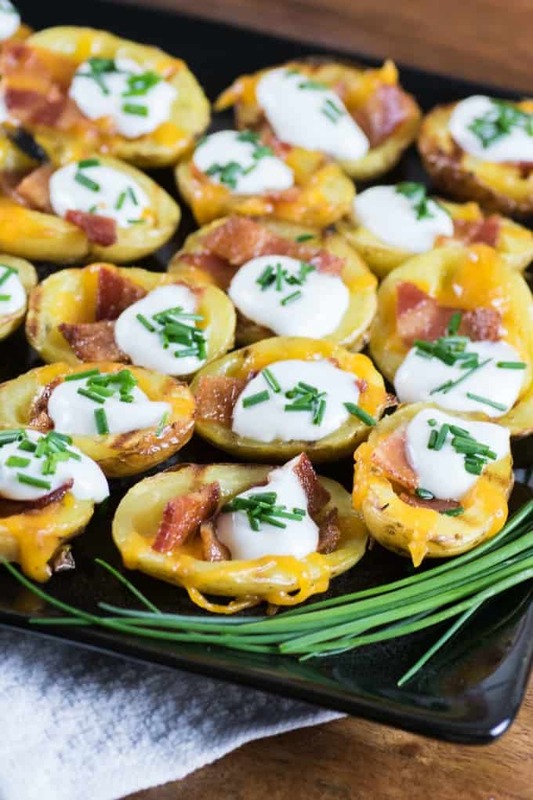 Little Potatoes are the perfect vessel for so many appetizers. I just love the convenience of them. We used 1.5 lbs. 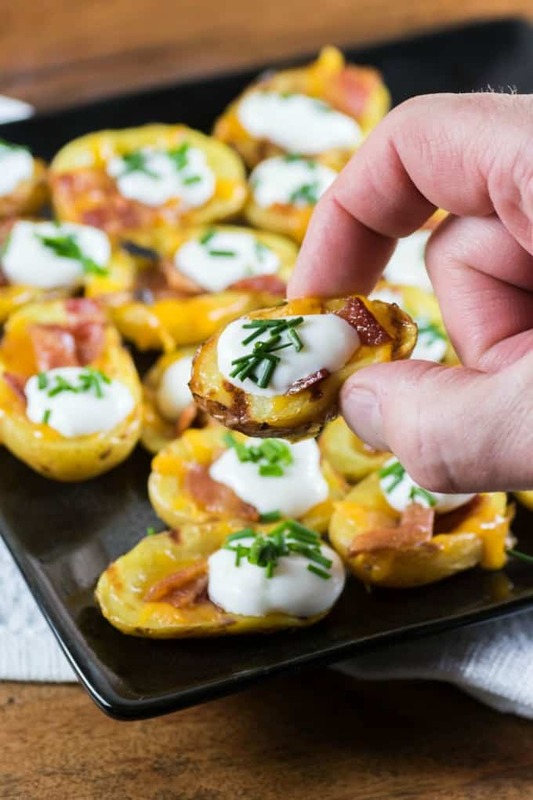 for this recipe but it could be easily doubled for a large group and make up to 80 Grilled Little Potato Skins, YUM! They make the perfect little popper, don’t they? My tummy is grumbling just looking at these again! These Grilled Little Potato Skins are a perfect summer recipe done on the BBQ and not heating up the house by putting on the oven. 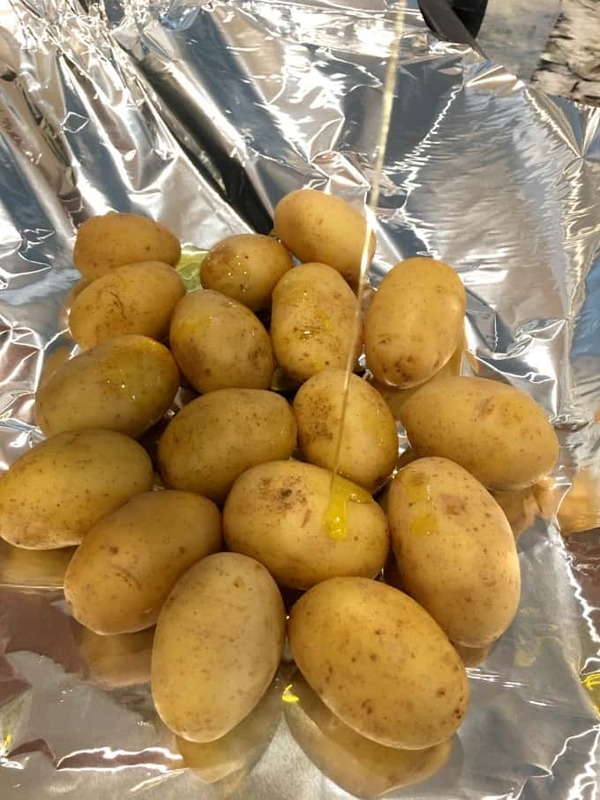 In a large piece of heavy duty foil place in the potatoes and drizzle with half the ¼ cup of olive oil. Sprinkle on the Kosher salt and toss to coat. Seal up the foil pouch and BBQ on medium high indirect heat for 35-40 min. or until just done. Let cool to touch. Slice potatoes in half lengthwise. Scoop out a small amount from each potato and reserve for another use. 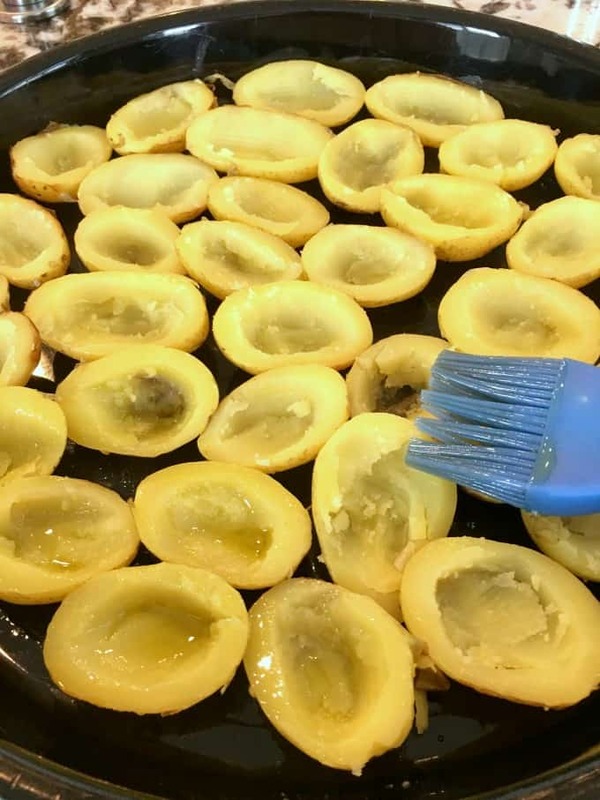 Using a grapefruit spoon works well, careful not to take out too much potato or to puncture the skin. Lay out on a tray and brush the open sides with the remaining olive oil. BBQ cup side down on medium high to get grill marks. Place on a foil tray. Fill each skin with a small amount of cheddar cheese and them bacon, (you can make them to this point ahead of time and refrigerate). Place the foil tray on the BBQ on indirect heat again and close lid. BBQ until the cheese melts. Top each skin with a dab of sour cream and chives. This is what I would like with a good steak and salad.. These look so delicious and easy to make. I often buy The Little Potato Company products. My kids love the size and there are so many fun recipes you can use them in. I am definitely going to give this a try. 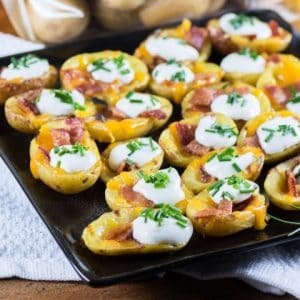 These potato bites look amazing!!! I would love to grill up a batch for my family too. I love potato recipes that don’t require peeling! These are so cute and look super yummy! It looks amazing! I can’t wait to try it this weekend! My company will love it!